Not only can the “low thyroid” symptoms of patients with normal thyroid blood tests respond beautifully to the right thyroid medicine given in the right way, but they can also remain improved even after the treatment has been discontinued. There are a lot of people who suffer from debilitating symptoms that are consistent with low thyroid system function, in spite of their thyroid blood tests being in the normal range. Their symptoms often respond predictably and dramatically to a special thyroid treatment recently developed (described in this manual). Most significantly, their symptoms often remain improved even after the treatment has been discontinued (a sort of “resetting” phenomenon). This resetting phenomenon is not really seen when T4-containing medicines are implemented, but only when T3 or liothyronine is used. These observations and many more suggest the existence of a condition not previously described, Wilson’s Temperature Syndrome. Those patients who respond well to the treatment for Wilson’s Temperature Syndrome, typically present with low oral temperatures. Their symptoms tend to come on together and persist after a major stress. Some people are more prone to developing Wilson’s Temperature Syndrome than others. Candidates for this treatment protocol have body temperatures that run on average below normal. Their temperatures, measured orally, average less than 98.6 degrees F. (In fact, in about 93% of cases patients’ temperatures average less than 97.8). Classically, their symptoms come on together after some major physical or emotional stress, such as: childbirth (#1 cause), divorce, death of a loved one, job or family stress, surgery or accidents, excessive dieting, and others. When the symptoms come on together it is more likely that they are related. Typically, they are going along fine in their lives,when they go through some major stress, develop symptoms consistent with Wilson’s Temperature Syndrome and are never the same. The symptoms can persist even after the stress has passed. Sometimes, however, the symptoms come on more gradually and less precipitously. This is more likely to occur in people who are more prone to developing Wilson’s Temperature Syndrome. Certain nationalities (especially Irish and American Indian) are more prone to developing Wilson’s Temperature Syndrome, and about 80% of sufferers are women. It seems that those who are most prone to developing Wilson’s Temperature Syndrome are those whose ancestors survived famine, such as Irish, Scot, Welsh, American Indian, Russian, etc. Interestingly, those who seem most susceptible of all seem to be those who are part Irish, and part American Indian. It is truly amazing how often patients who are classic for Wilson’s Temperature Syndrome turn out to have this ancestral combination. It appears that about 80% of Wilson’s Temperature Syndrome sufferers are women (which is the reason that the pronouns “she”, and “her” will be used so often in this manual). Judging from patients’ symptoms and how and when those symptoms came on it’s easy to predict whether or not they have low body temperatures. Interestingly, people with classic stories for Wilson’s Temperature Syndrome have greater than a 199 chance out of 200 of their temperatures averaging below 98.6 degrees. In fact, if such people find that their temperatures are averaging 98.6 or above, it is more likely than not that their thermometers are faulty, and they should verify the readings with another oral thermometer. The low body temperature causes the symptoms of Wilson’s Temperature Syndrome, and treatment is aimed at raising the temperature to normal. If people do not have low body temperatures, then they do not have Wilson’s Temperature Syndrome, and therefore, need not pursue this avenue any further. Note: Some people have noticed that a large portion of our population are running temperatures that are lower than the accepted normal of 98.6. Interestingly, rather than wondering if or being concerned as to why our temperatures might be running lower these days, they seem to prefer simply lowering the accepted normal, and consider it healthy. The function of the entire metabolism depends on the body temperature, because it dictates the shape and therefore function of the body’s enzymes (see Lehninger’s Biochemistry textbook). The metabolism is the sum of all the chemical reactions in the body, virtually all of which are dependent upon (catalyzed by) enzymes. How an enzyme functions depends on its shape, or conformation. An enzyme’s shape depends on its temperature. 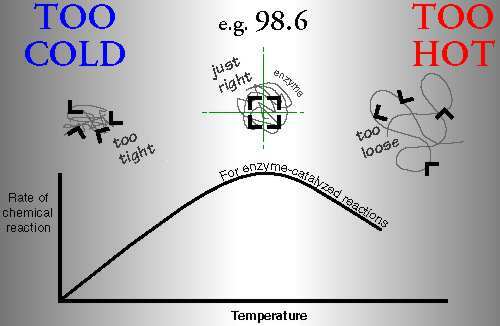 When enzymes are too cold, they are too tight. When they are too hot, they are too loose. When they are just the right temperature, they are just the right shape, and function with the most ease. When the temperature is too hot, too cold, or unsteady, the enzymes will spend less time in their optimal shape-which simply translates into having a less than optimal metabolism. Our bodies struggle to maintain a body temperature very close to 98.6, for good reason (entire metabolism depends on proper temperature). You and I have body temperatures that run about 22.5 degrees above typical room temperature, while the picture on the wall and just about everything else in the room is about 22.5 degrees cooler. How strange. And now, if I walk into a 30 degree freezer, and you walk into a 120 degree sauna, our body temperatures will still be about the same temperature 15 minutes later (but I will be shivering and you will be sweating). This is no coincidence. It is amazing. People can be tall or short, adult or child, male or female, heavy or skinny, white, black, brown, or otherwise; but their temperatures are all about the same. It’s hard to imagine a characteristic that changes less between people than do their body temperatures. Why do their temperatures have to be so similar? Because enzyme function depends on shape; and shape depends on genetic coding, and temperature; and the amino acid sequence of each of the different enzymes is very similar from person to person. If one does not struggle with the fact that the amino acid sequence of one person’s Lactose Dehydrogenase (LDH) or Glucose -6- Phosphate Dehydrogenase (G6PD) should be very similar to another’s for the sake of proper function, then one needn’t struggle with one person’s temperature, for optimal function, needing to be very similar to another’s. In other words: Individuals’ optimal temperatures for function will be as similar as the genetic coding of their enzymes on the whole (i.e., very similar). This is one reason why body temperature is such a good guide to thyroid hormone treatment. The range of normal for body temperatures (in relation to randomness) certainly varies far less statistically than do those of thyroid hormone blood tests (for a more thorough discussion of this topic, see book: Wilson’s Temperature Syndrome – A Reversible Thyroid Problem). It is clear there is a continuum of body function along the temperature gradient between the two extremes. For people with severely low temperatures, the warmer they get the better they feel, up to a point. For those with severely high, the cooler the better, up to a point. High fevers (107 degrees F) can cause denaturing of the enzymes, brain damage, and even death. Severe hypothermia (<90 degrees F) can also be a life-threatening medical emergency. A fever of 100 degrees (1.4 degrees above 98.6) can produce familiar symptoms of fever. It is easy to see how mildly depressed temperatures (1 – 1.5 degrees below 98.6) can also produce a very characteristic set of symptoms. It is obvious that the proper functioning of the body vitally depends on it being at the right body temperature. Wilson’s Temperature Syndrome is characterized by a downward shift in the patient’s temperature pattern, and treatment is directed at raising it to normal. Sampling the temperature by mouth during the day is a more specific and less sensitive test than measuring it only in the morning upon waking. I recommend that the temperature be taken by mouth every 3 hours, 3 times a day, starting 3 hours after waking, and averaged for several days (not the 3 days prior to the period in women since it’s higher then). I feel this method is a more specific and less sensitive diagnostic tool than others. And, it is even more useful than other methods when it comes to management, as will be discussed later (p41). Persons with Wilson’s Temperature Syndrome usually have a normal diurnal variation in their body temperature patterns, but they are shifted down about a degree. Their symptoms are, by far, most likely to resolve when proper treatment has shifted their body temperature patterns up to around normal. The hypothalamus stimulates the pituitary gland to stimulate the thyroid gland to produce the precursor T4 which is converted to the active hormone T3. The body temperature is in large part regulated by the thyroid hormone system. The hypothalamus stimulates the pituitary gland to produce Thyroid Stimulating Hormone (TSH). TSH stimulates the thyroid gland to produce T4 (thyroxine) which is the raw material or precursor used to make the active thyroid hormone T3. T4 is also converted to RT3 (reverse T3) which is physiologically inactive. 80% of the active thyroid hormone (T3) is produced outside the thyroid gland, in the periphery of the body. T4 is not the physiologically active hormone and needs to be converted by an enzyme called 5′-deiodinase to become the active hormone T3, or liothyronine. At least 80% of the body’s daily production of T3 is produced in this way, not in the thyroid gland, but in the tissues of the body (liver, kidney, etc.). [no prime] deiodinase) plucks the iodine atom off the 5 position of T4 to make RT3. T3 is the physiologically active thyroid hormone and is 4 times more potent, and 3 times shorter-acting than T4. T3 is what goes to all the cells in the body and tells them how fast to operate, and that determines the body temperature. 5′ deiodinase has two jobs. It converts T4 to T3, and it converts RT3 to T2. 5 deiodinase (as opposed to 5′ deiodinase) is the enzyme that converts T4 to RT3. 1. T4, by far, accounts for most of what is produced in the thyroid gland itself (about 10 times less T3, and about 30 times less RT3 is produced than T4). 2. More T4 is converted to RT3 than to T3. The fact that serum RT3 concentrations are lower than those of T3 reflects its more rapid metabolic clearance. 3. And, >95% of the body’s production of RT3 occurs peripherally. 4. Like RT3, T2 is physiologically inactive. Under stress the body converts T4 less to T3 and more to RT3 to conserve energy. With less T3, the cells of the body slow down. This makes it clear that there is a peripheral autoregulatory mechanism as well as the glandular one that regulates T4 production. It is clear that there is a glandular autoregulatory mechanism (negative feedback inhibition), that regulates the thyroid gland’s T4 production. It is clear there is also a peripheral autoregulatory mechanism as well as a glandular one. This is because under conditions of significant physical, or emotional stress, the amount of T4 that is converted peripherally to the active T3 can drop by 50%. And at the same time, the amount of T4 converted to the inactive RT3 can increase by 50%. T4 to T3 conversion is inhibited by stress, acute and chronic illness, fasting, glucocorticoids, propylthiouracil, and other things.When the body shunts T4 away from T3, and more toward RT3, the cells of the body slow down.This is done to conserve energy and that’s normal. After the stress has passed, the metabolism is supposed to come back up to normal but sometimes it doesn’t. Since 5′ deiodinase processes both T4 and RT3, when the enzyme is preoccupied with an increased proportion of RT3, it can’t process as much T4 per unit time. Thus RT3 can competitively inhibit T4 to T3 conversion, which could lead to more RT3 accumulating, and the start of a vicious cycle. A study has demonstrated that in vitro, RT3 can inhibit the conversion of T4 to T3 presumably by competitive inhibition. (see reference #1 of Review Article). When T4 to T3 conversion drops, T4 to RT3 conversion goes up. It is likely that the RT3 that accumulates as a result, can then secondarily further inhibit conversion of T4 to T3, resulting in more T4 being converted to RT3, less to T3, and so on; with the body getting stuck in a vicious cycle, a sort of coping mechanism gone amuck. This would explain why the resetting phenomenon is not seen until RT3 is depleted for a time, and why the resetting phenomenon is not really seen with the use of T4 but only T3. When a Wilson’s Temperature Syndrome patient is weaned off T4-containing medicine, the returning endogenous T4 production contributes to a T4/RT3 milieu that is no more favorable (possibly less), for T4 to T3 conversion than prior to treatment. However, when a Wilson’s Temperature Syndrome patient is weaned off T3 therapy and the endogenous T4 production comes back up, the 5′ deiodinase enzyme is presented with a milieu richer in T4 (since RT3 levels have been depleted) and can provide more T4 to T3 conversion than prior to treatment. When a patient is treated with T3, the endogenous production of T4 and therefore, RT3 is decreased for a time. On the other hand, when a patient is treated with a T4-containing medicine, endogenous T4 and RT3 production decrease, but T4 and RT3 levels do not, because of the exogenous T4 supply. How well a person feels depends a great deal on enzyme function, which depends on body temperature, which depends primarily on T3 stimulation of the cells. Under certain circumstances, decreased or impaired T4 to T3 conversion can be maladaptive. When the cells of the body slow down, the body temperature drops, the enzymes get cold and do not function as well, and a characteristic set of symptoms occur. These symptoms are not random symptoms, but are consistent with the symptoms of low thyroid system function. Note: A study has shown that the level of T4 to T3 conversion can even mean the difference between life and death. The study showed that SICU patients with higher RT3 levels and/or lower T3 levels were significantly more likely to die. Wilson’s Temperature Syndrome can be thought of as a persistent, maladaptive, stress-related, reversible impairment in the conversion of T4 to T3.